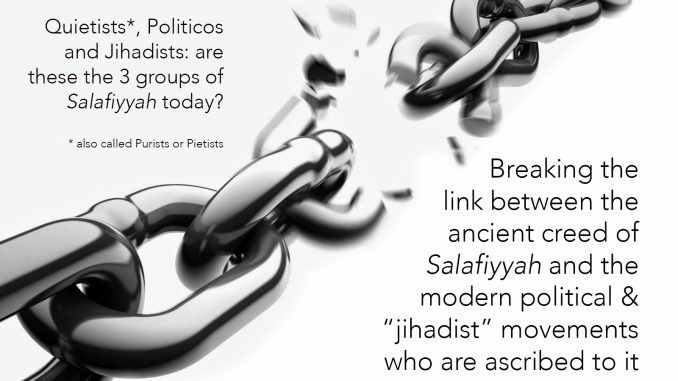 A response to Western academics who categorise Salafis into Quietists, Politicos and Jihadists – and why this is a false categorisation. 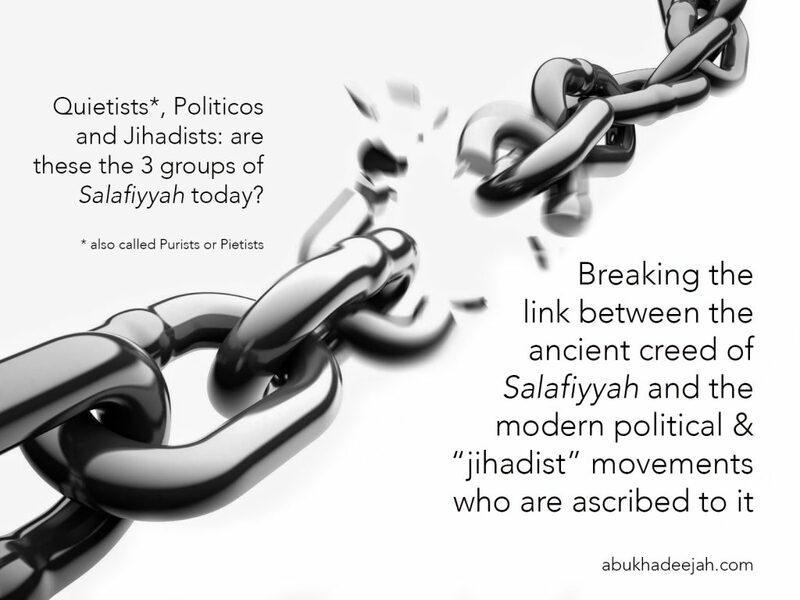 Many “academics” who try to understand Salafiyyah talk of three groups of Salafis in our times: 1, the Quietist/Pietist Salafis, 2, the Political Salafis and 3, the Jihādist Salafis. Then they attempt to explain the three trends in light of what they perceive to be Salafist doctrine. However, the very premise that the Salafis (as defined theologically) are three groupings is false because the Prophet and his Companions were “one Jamā’ah”, that is to say “one group” or “one body” in theological terms – and that is what the term Jamā’ah refers to. The Prophet (ﷺ) himself referred to the many groups of Muslims that will arise after his passing away, just as the numerous sects that arose after the Prophets Moses and Jesus respectively. The Prophet Muhammad enumerated these sects as seventy three in number as occurs in an authentic hadeeth. In this hadeeth he declared one group/sect to be “saved” and named it, “the Jamā’ah” or as occurs in a narration, “that which I and my Companions are upon today.” It is that one collective body that are referred to as the Salaf, as well as the early generations who followed them – it is indivisible in terms of its creed and methodology, therefore those who follow these Salaf are also indivisible in creed and methodology. This leaves no room for manoeuvre for those claiming to be “the Jamā’ah” and are simultaneously in violation and opposition to what the Prophet and his Companions were upon whilst he was alive. The gross mistake made by most Western academics in trying to understand Salafism (or Salafiyyah) is their assumption that any person or group that affirms the “Salafist creed and theology” outwardly, is judged to be Salafist regardless of their “jihadist manifesto”, “modernist methodology” or “political orientation”. That is to say, that in the view of these Western academics, Salafiyyah is defined as the adoption of a particular creed connected primarily to the matters of the unseen (al-ghayb), such as Tawheed (belief in the Oneness of Allah and worship of Him), the events in the Hereafter, the unique names and attributes of Allah, trials of the grave, belief in the Angels and so on. Equipped with this definition, they move on to include any sect that shares this “Salafist theology” and all other differences are superfluous or minor as it relates to what defines the core of Salafism. So contrary approaches to rulership, rebellion, caliphate, innovations, jihad, walā and barā, takfīr, iqāmatul-hujjah, etc, do not encroach upon the “shared core tenets” of Salafism as defined (or perceived) by these academics. Practically, that means that a large body of creed (‘Aqeedah) and Prophetic Methodology (Manhaj) are excluded from this imposed definition upon Salafiyyah. When one researches the credel treatises compiled by the early Scholars of Sunnah, in the first three to five centuries after the passing away of the Prophet (ﷺ), such as the writings of Abu Hātim, Abu Zur’ah, Sābūnee, Lālikā’ee, Khalāl, Tahāwee, Ahmad Ibn Hanbal, Abu Dawūd as-Sijistānee, Ibn Abi Bakr as-Sijistānee, Ibn Battah, Al-Barbahāree, Bukhāree, Marwazee, etc, one clearly and decisively comes to the conclusion that the creed of the Salaf was not limited to a handful of beliefs (in the unseen) such as the names and attributes of Allah, events in the grave, the Hereafter, pre-decree and so on. They would also include, very powerfully into their writings in the ‘aqeedah (i.e. the creed) matters related to rulership, rebellion, innovation, heresy, dealing with heretics and ahlul-bid’ah, methodology in approaching the texts, the place of the intellect in understanding the revealed texts, interaction with oppressive regimes and governments, takfīr, walā and barā, etc. Indeed these theological/credel/methodological treatises are considered as foundational readings for the Salafis – it is in these writings that the people of Sunnah/Salafiyyah derive their core beliefs, their ‘aqeedah, their manhaj, their usūl. It is around these foundational beliefs that they would establish allegiance and disavowal (i.e. al-walā and al-barā). These revered scholars, who penned down the creed, and those who came before them, are referred to collectively as the Salaf. So Western academics who have not read and studied these classical works of Salafi creed and methodology cannot possibly categorise Salafis into the groups that we now commonly hear of. This modern-day categorisation of Salafiyyah into three is based upon the claims of various political and “jihadist” groups who ‘ascribe’ to Salafiyyah seeking authenticity and validation for their actions, and in turn are seen by the Muslim populace as “authentic Muslims”, because they follow the Salaf (or so they claim). Many Western academics/writers have fallen for this myth, and based upon it, they fell into the trap of redefinition and reductionism of what it means to be a Salafi. These academics have fallen short in researching the oldest works that define Salafist theology, i.e. Salafiyyah itself, and instead opted for the easiest approach: Salafism is whatever the modernist groups define it to be! They then proceeded to look for all the sects that shared some common “concepts of tawheed, shirk, names and attributes, pre-decree, etc” and placed them into one block, known as “Salafism”. Finally, they subdivided this block in to three: Quietists, Politicos, and Jihadists. Since then almost every Western academic has based his or her writings regarding the Salafis in light of this categorisation. My simple argument is that if the foundations of this premise are faulty, surely the subsequent teachings and policy decisions will follow suite. Salafiyyah/Sunnah is not a title given to a group of people who simply claim it for themselves and because we see them oft-mention certain popular names of past scholars that are revered by the Muslims and the Salafis in particular, such as Ibn Taymiyyah, Ibn Abdul-Wahhāb, etc. The Salafiyyah of a person or group must be measured in accordance to their adherence to those treatises written by the scholars of old. A clear example of one of those treatises that is renowned and widespread, and translated into English is “The Explanation of the Creed (Sharhus-Sunnah)” by Al-Barbahāree (died 329H), or “Foundations of Sunnah” by Ahmad Ibn Hanbal (died 241H), or “Mountains of Knowledge” which is a compilation of the creed of no less than twelve great scholars of the past. When reading these works (let alone countless others), one comes to the conclusion that the path of Salafiyyah/Sunnah is one, and it does not sub-divide into three (or more). The Salafiyyah of a person or a group should be judged upon these and other writings that are clear definers of Salafiyyah/Sunnah. The scholar Imām Al-Awzā’ee (died 157H رحمه الله) was asked: “Are you a true believer?” He responded: “The matter which is being asked about is an innovation. Our Prophet (ﷺ) did not legislate such a question. Be patient upon the Sunnah – and stop where those before you stopped, and speak with what they spoke with, and refrain from what they refrained from, and proceed upon the paths of your Righteous Predecessors (Salaf) for whatever sufficed them will suffice you. The people of Syria (Shām) were unaware of these innovations until they were thrown in their direction by some of the people of Iraq. And if there was any good in this [innovation], you would not have been the first to be singled out with it to the exclusion of your Predecessors (Salaf). So when these modernist “jihadist” and political groups claim attachment to Salafiyyah/Sunnah, it must be rejected outright because they oppose the writings of the early Salaf in many matters of creed and methodology, and they contradict the usūl of the Salaf. They innovate means and methods of “reform” and “rectification” in religion never used and never known by the Salaf, such as: street demonstrations, rebellion, revolution, uprisings, anāsheed, suicide bombings, targeting civilians to be kidnapped and killed, burning alive prisoners of war, reviling the rulers from the pulpits and inciting the masses against them, innovating and tolerating innovations for “the greater good”, bombing Muslim cities and populations, killing non-Muslims in their homelands and those who visit Muslim lands, killing ambassadors and emissaries, rebelling and rejecting the rule of the tyrannical rulers (and kings) over Muslim nations, riling up the masses against the regimes, waging war without an authority, declaring rulers to be unbelievers because they are not judging by God’s law, establishing walā and barā around innovated principles, not beginning with the methodology of the Prophet in inviting people to Tawheed and Mutāba’ah, and their claim that there is no Muslim nation that judges by the Shari’ah, and so on.